- At Sandvik Hard Materials we regard the cutting function as a single system that forms an integral part of the converting line. Using Sandvik CRC (Carbide Rotary Cutters), your converting line will face no restrictions in the cutting function (up to 1800 pieces/min). 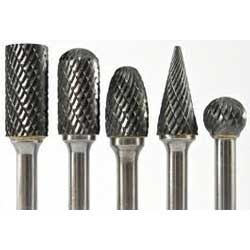 We have been counted amongst the most trusted names in this domain, engaged in offering a standard quality range of Rotary Carbide Cutter. These tungsten carbide rotary burrs are manufactured using high quality raw material procured from the renowned manufacturers in the industry and passes through a stringent quality test before being procured. Our personnel make sure that these are at par with the prevailing industry standards. Carbide Rotary Burr are a rotary analog to files that cut linearly (hence their alternate name, rotary files). 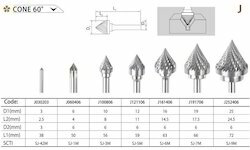 They are also in many ways comparable to endmills and to router bits; a distinction is that the latter usually have their toolpath controlled by the machine, whereas Carbide Rotary Burr are often used freehand. We have created a domain in manufacturing Brazing Type Carbid Rotary Cutters. The carbide rotary cutters, we offer are fabricated using high grade polymer industries. Our high quality cutters are eco-friendly in nature and are known for easy operation, low maintenance and durability. We are offering best quality and wide range of Carbide Rotary Cutters.